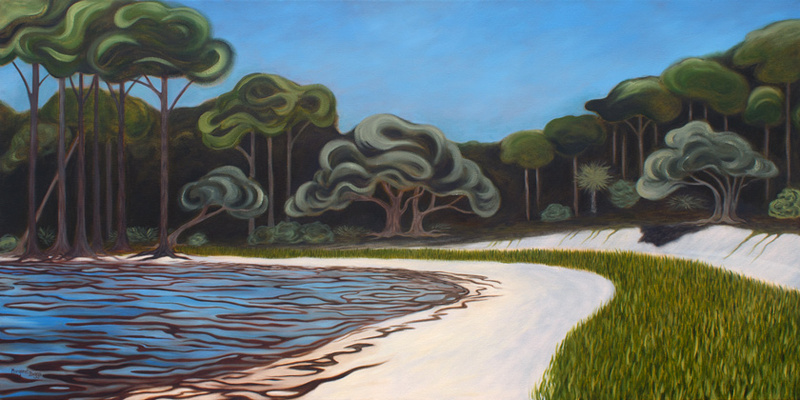 The inland waters of the Coastal South are lined with the Southern Live Oak, Yellow Pines, Palmetto bushes and Palms. The beaches are littered with dry seaweed. The shallow waters are often full of the grasses where the crabs crawl and the hermit crabs hide. It is a good place to fish, crab, and look for shells, though the textured seaweed has always bothered me. I walk through it when I must, to get from the boat to shore or to scoop crabs when the strange creatures with their sweet meat are “running.” The woods along these shores are a place of wonder. The Live Oaks are there to climb while the pine needles fill the air with their pleasing smell. It is a retreat from the heat and a place to hide from the troubles of everyday life, at least for a time, in my mind.